In their present-day tourist trap of an lrish seaside town, famed for its supposed involvement with selkies in the past, three sisters are faced with the sudden disappearance of their mother. Crushed by the loss, their father is struggling to carry on. To-make matters worse, there are rumours afloat in the village that their mother herself is a selkie who has now shed her human form and gone back to sea. 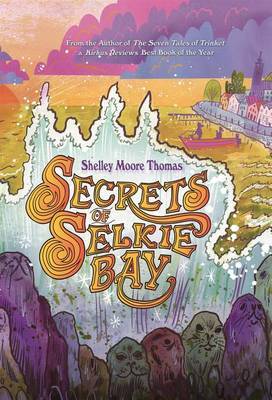 As Cordie Sullivan, the oldest daughter, tries to learn more about her mother's vanishing, she must find the strength to help her family move ahead, even as she discovers an increasing number of clues that point to a hidden island off the coast - a mythical kingdom of the selkies. Explores grief and loss, as well as the comforting power of stories and belief in magic that can chase away sadness. She cleverly toys with readers' expectations . . . and the fanciful folktales interspersed throughout the novel add plenty of charm. "Booklist"
Thomas spins a tale in present-day Ireland of a family coming apart and a brave girl tasked with responsibilities beyond her age . . . Readers looking for a strong main character or intrigued by Celtic folklore will find much to enjoy. "Kirkus Reviews"
The surprise ending leaves the door open for a little belief in magic. "School Library Journal""